Vanilla by Name but not by Nature…? With The Great British Bake Off sparking people’s interest in baking, Victoria sponge is all the rage. But your bog-standard eggs, sugar, butter and flour would be nothing without the sweet, fruity fragrance of vanilla. This versatile and notoriously expensive flowering plant is used as flavouring, in perfume and in aromatherapy. 1. Vanilla was first cultivated by the Totonac people of eastern Mexico in the 15th century. In the early 16th century, the Spanish arrived in eastern Mexico, and it is from the Spanish ‘vaina’ that the word ‘vanilla’ comes from, translating as ‘little pod’. An old Totonac myth describes how the vanilla orchid first started to grow – when the Princess Xanat eloped with a mortal to the forest. This union was forbidden by her father and so the two were caught and beheaded, and as her blood touched the ground, the tropical orchid began to grow. The picture above shows a vanilla sponge cake, surrounded by conical flasks. Conical flasks are used for lots of different applications in the chemistry laboratory; they are used to hold and heat liquids during recrystallisation, simple reactions and when mixing different liquids or making solutions. In between the flasks are flowers of an orchid; a relative of the plant from which we get vanilla. 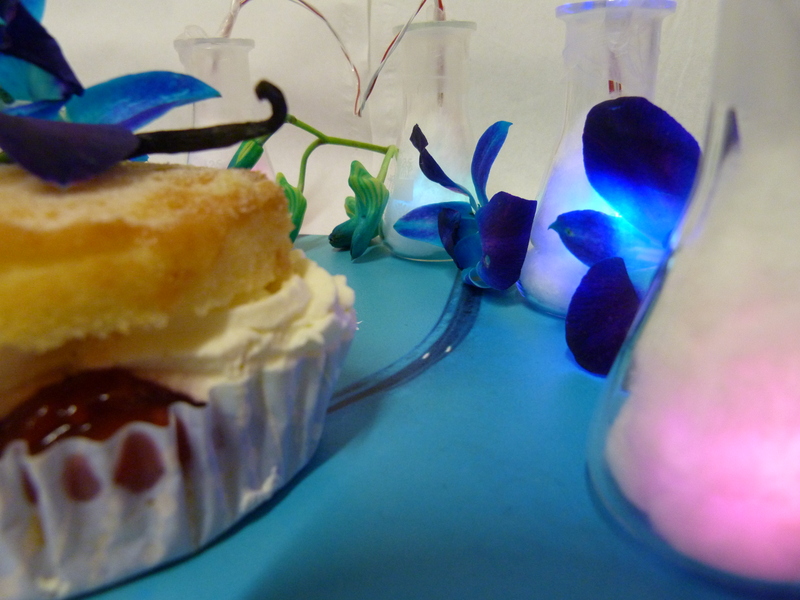 The molecule shown above the cake is vanillin. Vanillia is obtained from a member of the Orchidaceae family plant, Vanilla planifolia. It is from the seed pods of Vanilla planifolia that the distinctive, identifiable flavour vanilla comes from. The vanilla plant naturally grows only in tropical and subtropical regions and, as such, is the second most expensive spice that is commercially available, falling behind only saffron. This is because the cultivation of the vanilla plant for commercial use to meet the high demands of modern consumers is a very labour-intensive process, where the flower of the plant needs to be hand-pollinated, to mimic the pollination by the hummingbirds and bees that are native to Mexico and Central America. The smell of vanilla comes from over 200 odorant molecules, but the molecule that is its main contributor to the fragrance and flavour is vanillin. 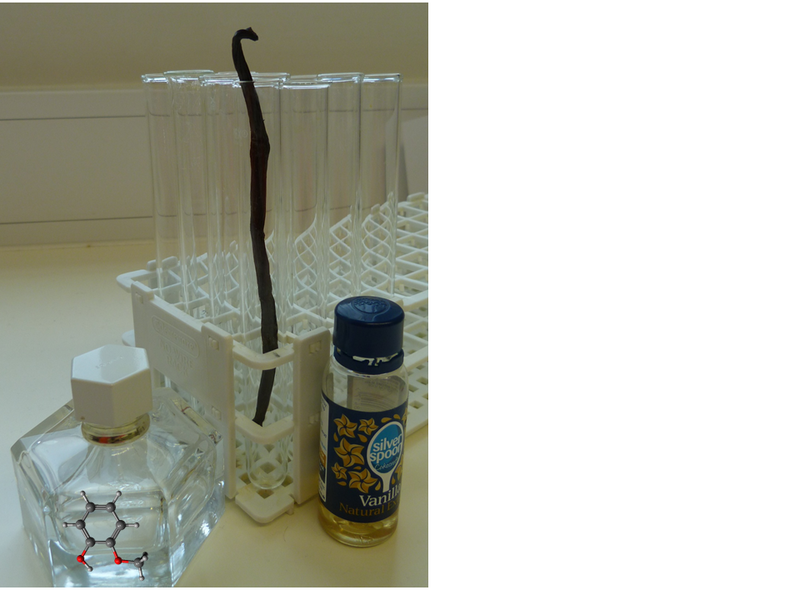 Artifically synthesised vanillin now contributes to over 95% of all vanilla flavouring sold, due to the high cost of growing the plant (RSC Chemistry World, Chemistry in its element: compounds, podcast). Vanillin was first isolated from a dried vanilla extract in 1858 by a French chemist, Nicolas-Theodore Gobley (Journ. de Pharm. et de Chem., 1858, 3, 34), but it was not completely pure. The first industrial production of vanillin came from a synthesis starting from coniferin, found in the bark of pine trees, by two German chemists Ferdinand Tiemann and Wilhelm Haarmann, in 1874 (Berichte der Deut. Chem. Gesellschaft, 1874, 7, 1, 608 – 623). The uses of vanillin are wide and varied. We are familiar with its prominence in baking and in chocolate manufacture, and even its involvement in the perfume industry, but a huge amount of the world’s synthetic vanillin is used in the synthesis of other chemicals, such as pharmaceutical drugs. Not only this, but vanillin is used in food products as an additive to mask unpleasant flavours that may arise from oxidative degradation of other chemicals in the food. Vanillin has been reported as having antioxidant properties in complex foodstuffs that contain polyunsaturated fatty acids (J. Sci. Food Agri., 1989, 48, 1, 49 – 56). 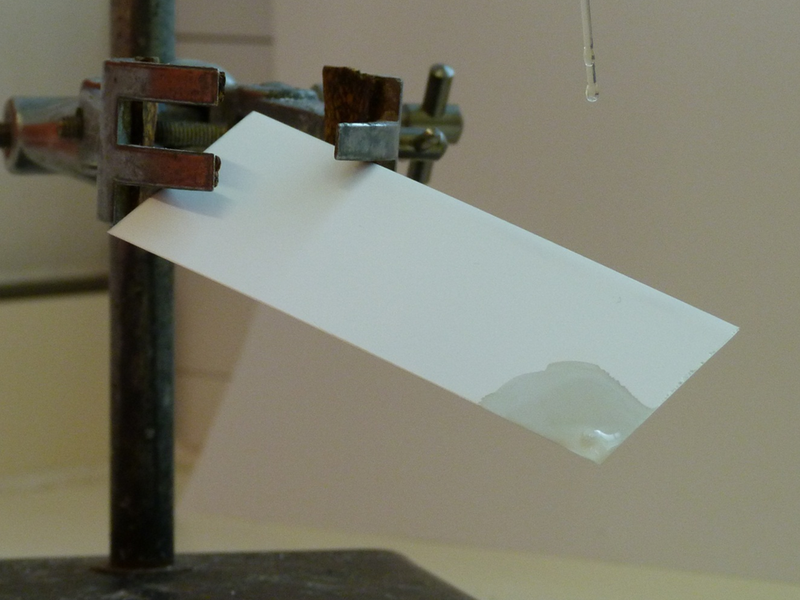 Synthetic vanillin being dropped onto a TLC plate. 2. Vanillin is also used by chemists in the laboratory. Solutions of vanillin and sulphuric acid are used in thin layer chromatography (often abbreviated to TLC, see Chemguide for an introduction to this technique)– a technique used by chemists to separate components of a compound based on their solubility. It is also used in the pharmacuetical world; for for example, the development of the drug L-dopa – used in the treatment of Parkinson’s disease (UNEP Publications, OECD SIDS, Vanillin). Interestingly, the distinctive smell of vanilla is not present in freshly picked vanilla pods. This is because, in such pods, the vanillin is stored as β-D-glucoside and is not released until the pod is cured. During curing, some of the vanillin β-D-glucosidase is converted into vanillin, with the rest being converted, upon consumption, by enzymes in saliva (Appl. Environ Microbiol., 2009, 75, 9, 2675 – 2774). Vanillin, in its natural form, is a white, crystalline solid, with a melting point of 81 oC. The component functional groups present in the vanillin structure include an aldehyde, an alcohol (present on benzene ring – a phenol), a methoxy group and, of course, the benzene ring. it is scientifically known as 4-hydroxy-3-methoxybenzaldehyde. The presence of so many functional groups means that vanillin is a molecule that can undergo many different reactions. 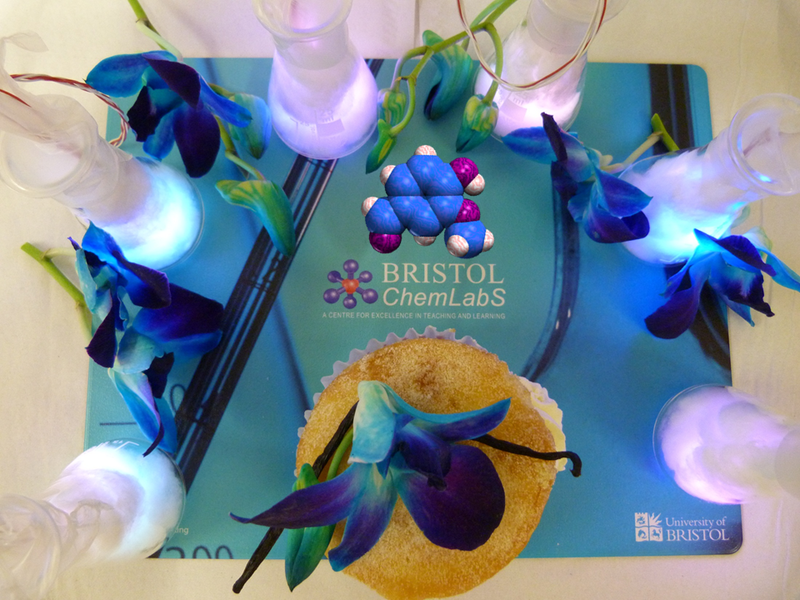 For example, in basic conditions the alcohol group will lose a proton and become negatively charged, making the molecule more soluble in water. A vanilla pod, standing in a test tube, with a molecule of guaiacol in a perfume bottle. 3. There are at least 10 ways to synthesise vanillin (Int. J. Pharm. Tech. Res., 2012, 4, 1, 266 – 279), the highest yielding of which starts from ferulic acid and uses Streptomyces setonii (a Gram-positive bacteria) to convert the ferulic acid into vanillin (Food Rev. Int., 2001, 17, 2, .119 – 120). The majority of modern-day syntheses are very similar to the original synthesis by Tiemann and Haarmann, but starts from guaiacol, which can also be obtained from the bark of pine trees. 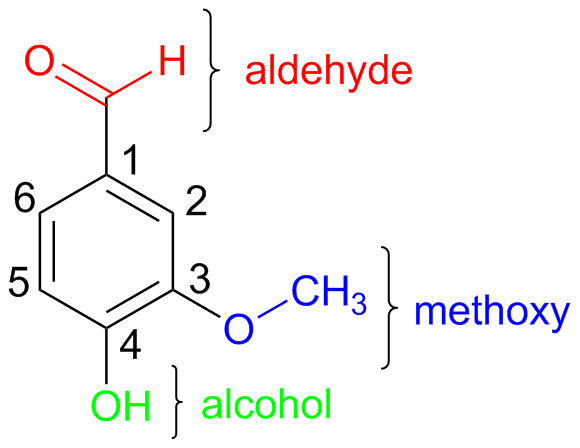 The synthesis of vanillin (3), from guaiacol (1) and glyoxlic acid (2), via electrophilic aromatic substitution, oxidation of a secondary alcohol and oxidative decarboxylation. This method has potential for a lot of side products, but the formation of these can be reduced by catalysing the oxidation of a secondary alcohol to a ketone using selective antibodies. The most common method of industrial vanillin synthesis on a large scale is from the starting product eugenol (J. Chem. Ed., 1977, 54, 12,776 – 778). This is naturally found in cloves, nutmeg and cinnamon and so is a relatively cheap and easily obtained starting material. The synthesis of vanillin (3), from eugenol (4) via isoeugenol (5). 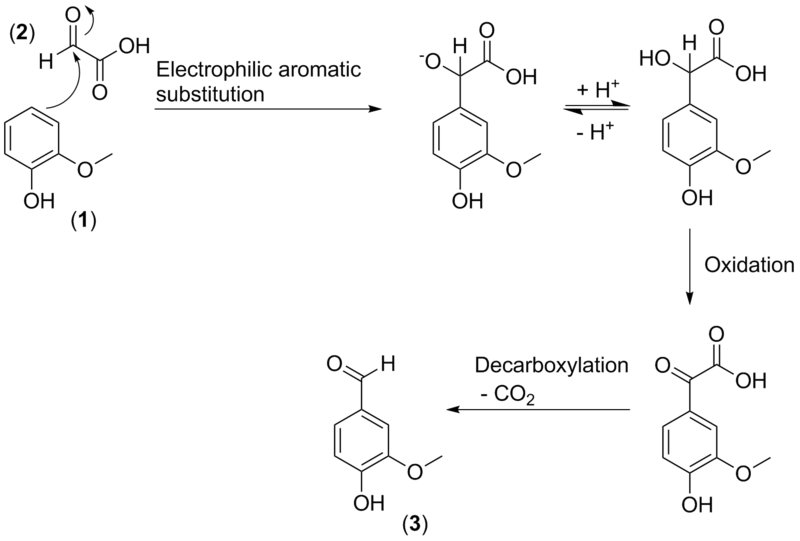 The synthesis involves oxidation of eugenol. The most common oxidative reactant used is nitrobenzene. Other oxidants can be used, for example potassium dichromate, but in this case, the alcohol would need to be protected to prevent this too from being oxidised. One way to protect this alcohol is to acetylate it. Lignin is a complex polymer found in the building blocks of wood and some cell walls in plants. Oxidation of lignin is yet another way to obtain artificial vanillin. Carrying out this process with alkaline copper solutions gives high yields of vanillin (J. Am. Chem. Soc., 1942, 64, 6, 1429 – 1431). The newest and most interesting way of synthesising vanillin came in 2006, when Mayu Yamamoto extracted lignin from cow dung (Terradaily, Japanese Researchers Extract Vanilla from Cow Dung, 2006). Her work won her the 2007 lg Nobel Prize. As well as the dramatically low production cost of synthesising vanillin this way (less than half the cost of synthesising vanillin from vanilla pods), this discovery benefits farmers too. Lignin does not readily decompose, and so the extraction of lignin from the excrement of grass-eating animals means the dung can then be re-used as fertiliser to improve soils. Contributers: Hannah Haines-Horan (words, photos, computational images & ideas), Nick Taylor (editing, ideas & support), Natalie Fey (computational structures), Jenny Slaughter (head image & editing). Categories: Biochemistry, Cookery, Industrial chemistry, Medicine, Plants, Scent, Synthesis, Uncategorized | Tags: aroma, biochemistry, chemistry, lignin, scent, smell, synthesis, vanilla | Permalink.